One river, three stages, four days, loads of music, comedy and festival goers with a passion for some of South Africa`s best music. From 31st January to 3rd February 2013, the usually quiet campsite close to Swellendam will once again be transformed into a slightly surreal spot of revelry, raging rock and soulful tunes, performances from another planet and shenanigans of the type you can only pull off when you`re safely tucked in next to the mighty Breede River for four days. No VIP nonsense. No pretence. No cliques. Just a beautiful river; three epic stage; thirty awesome live bands and some of our country�s coolest comedy acts. The line up for Up the Creek 2013 is going to be nothing short of fantastic and will be announced in November 2012. In typical Up the Creek tradition we will be running live music on 3 stages throughout the weekend: The 4th Street Main Stage, the MK River Stage and the all night long Rolling Stone SA stage. But remember, we will be running only one stage at at time, so that you don�t miss out on your favourite acts. 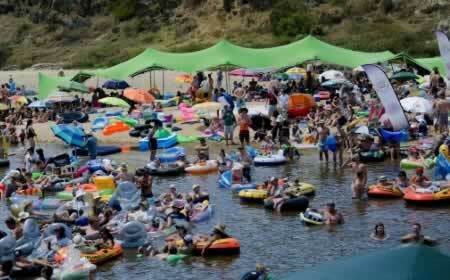 Where else can you float on a river, headbang to sick, soulful rocking tunes and sip on a Titanic. (Up the Creek`s special signature cocktail. Kids 13 years and younger: free entry.